Canning applesauce might sound overwhelming, but by following a few simple steps, you’ll learn how easy it is. It’s apple season! Canning applesauce can be a fun and easy tradition to start in your family. Keep reading to learn step by step how to get started. 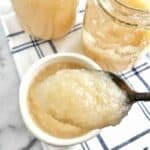 Learn how easy Canning Applesauce is! I recommend a larger apple peeler. This peeler works great! You’ll need a canning kettle with an insert. I suggest pint size jars for applesauce. Make sure the jars have lids and bands, or you can purchase these separately. You only need these if you have jars without lids. If you would like to make smooth applesauce you’ll need a sieve. They last forever. I have my great uncles sieve, he just passed away earlier this year at the age of 100. You’ll need a wide mouth funnel to get the applesauce from the pan into the jar. Each year the only replacement piece you’ll need are the lids. Once you open a jar you need to toss those out. Kids of all ages can help with this activity. At my house, my kiddos have been chopping apples for applesauce since they were 3 years old, with the use of my favorite children’s knives, Curious Chef. If you want your little one involved in chopping, you might want to check them out. Carefully remove and let cool. Lids should start making a popping noise as they seal. 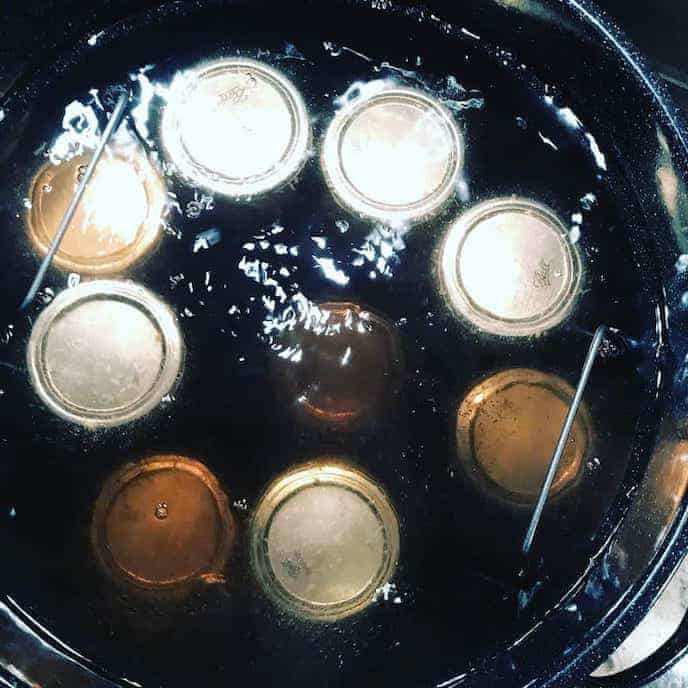 Press tops of lids – they should not give once sealed. If some did not seal properly, boil again, or keep in the refrigerator for 7-10 days. 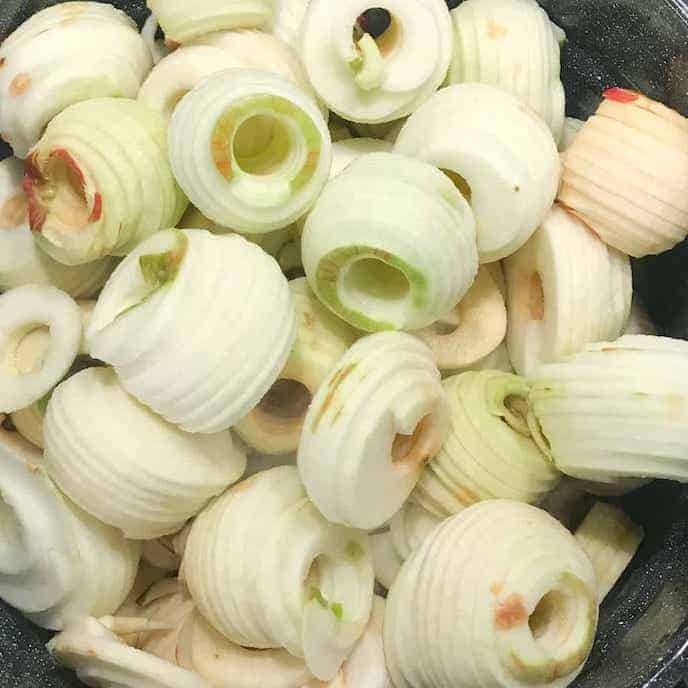 Use a large pot to cook peeled apples in a small amount of water. 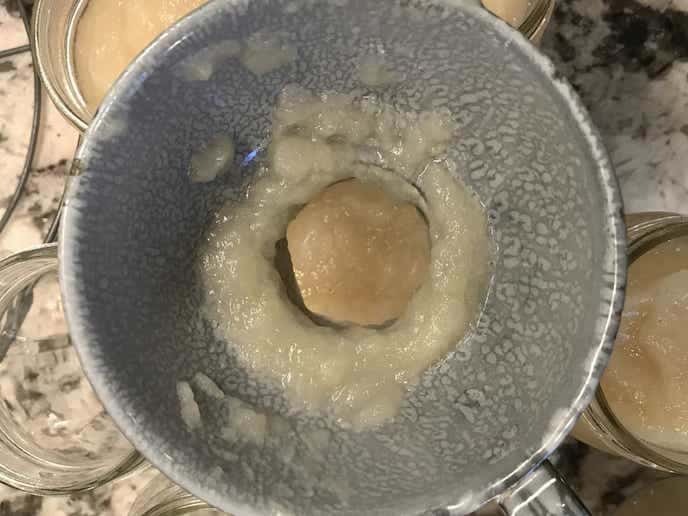 I use multiple kettles, so I cook the homemade applesauce in one of them, it fits a ton of apples. 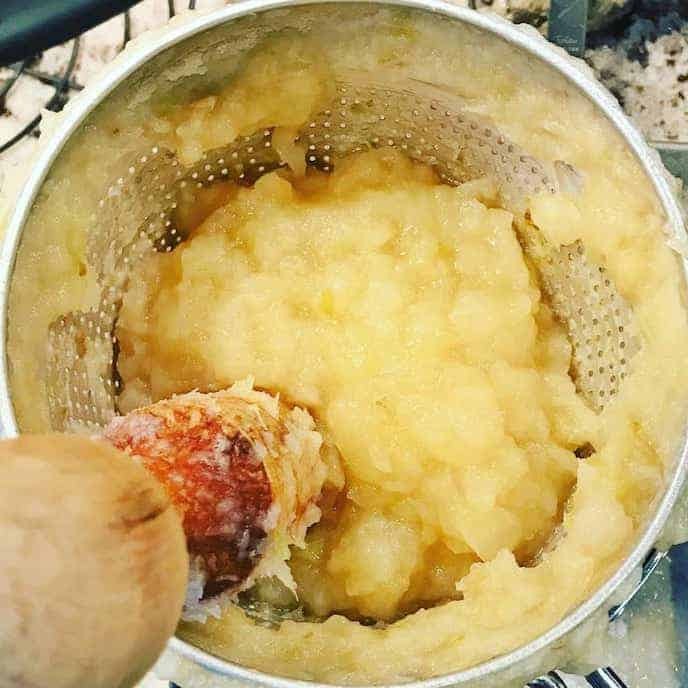 Once the apples are cooked, run them through a sieve if you like a pureed texture for your applesauce. You can skip this step and use the mashed sauce from cooking the apples down otherwise. 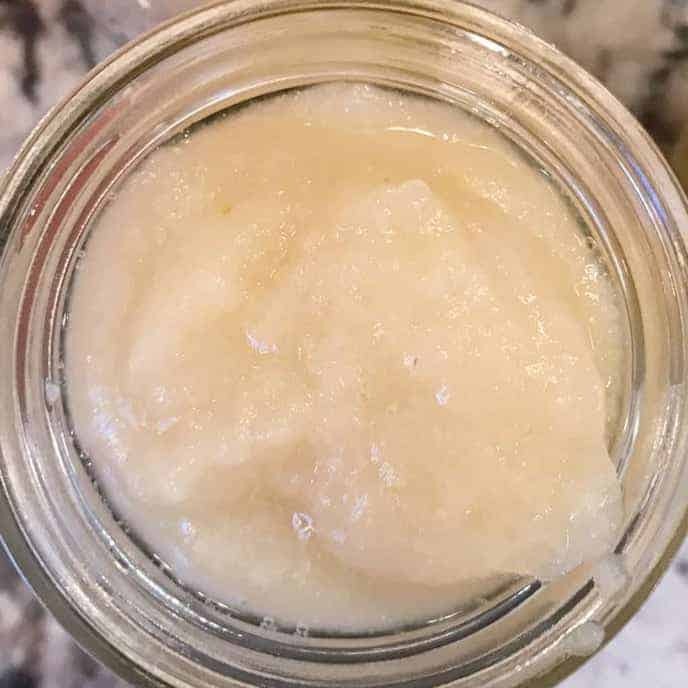 Use a funnel to get the homemade applesauce into the jars. Wipe the top of the jars off with a damp cloth and leave some space at the top of the jar. Carefully lower jars into boiling water and cook for the appropriate amount of time. Kitchen Tips: Use applesauce as a substitute for oil and butter in baked goods in a 1:1 ratio. By replacing the fat with homemade applesauce, you save both calories and fat, along with adding more nutrients to these delicious treats. Canning applesauce is easy to do following a few simple steps. Place peeled apples into a large stock pot with water. Cook over medium heat, stirring occasionally, for 30 minutes. Add more water if needed to get the desired consistency. *These are affiliate links – if you were to purchase one of the items, I would get a small amount of money – it would not cost you any more. Thanks in advance for helping support the Create Kids Club website. 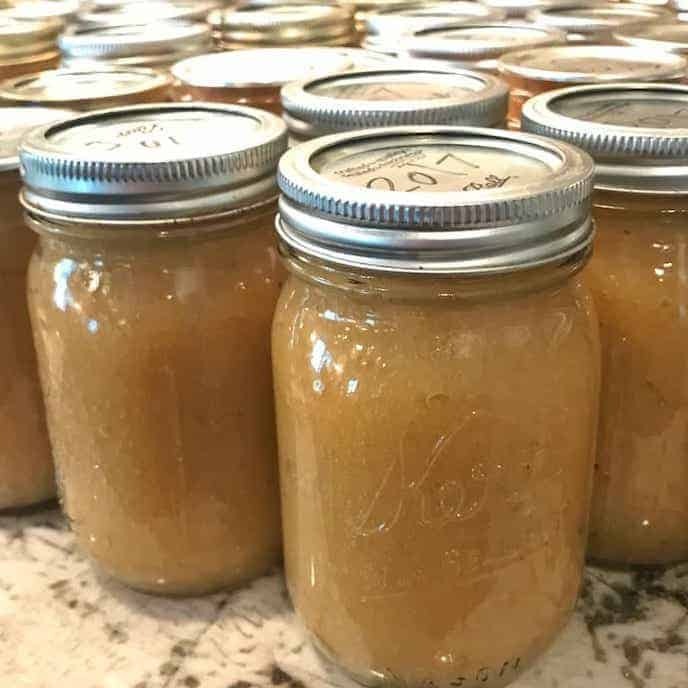 We love making homemade applesauce, I can’t wait to try canning soon!